“Doom.” A serious business that. While all sorts of collapses occur around us, competing for our attention, most of us circumbulate the creeping necropolis whistling sonatas along our iPod path, focused intently on our smart phones and not on the poverty, pollution or desperation permeating the air. These poems emerge from a place of bemused concern for my fellow man, and a yearning to connect with those people to whom Rumi cried out “don’t go back to sleep.” The images evoked in this collection of mostly 14-line poems bring out a fresh, even sassy perspective on these ever-darkening days of peak after peak after peak being reached, with attendant declines ensuing. A collective gallows humor animates these 55 packets of toxic release. Perhaps you will find inspiration to breathe in some of the cultural toxins out there and transform them through art into materials that will give birth to a new society. God Herself knows we need one yesterday! 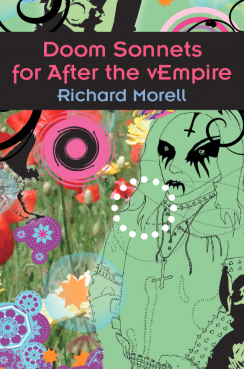 Richard Morell writes poetry, songs, plays, essays, and the occasional screenplay. He recently served as president of Classic Theater Guild, Inc., which produces works in Albany and Schenectady, and he holds an MFA in Dramatic Writing from NYU’s Tisch School of the Arts. He seeks out enlightened and “endarkened” others who embody the wisdom that we are the ones we’ve been waiting for. Every day Richard aligns his triple soul of Feral, Human and Divine and watches this unfolding triple crisis in bemused concern.